Just like an offer on a landing page, having a good “offer” for your event is essential. The event has to offer enough value for your prospects to remember it’s on and think it’s worth taking time out of their busy day to come and get involved. It’s also important that your offer only appeals to your target market, or you’ll have lots of people attending but not many that will later convert into customers, which is the main goal. 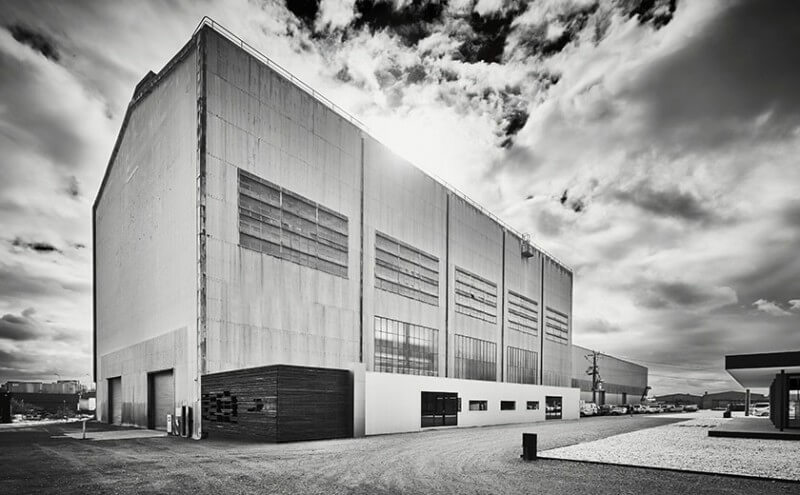 For Modular Builders, we decided to offer an exclusive behind-the-scenes look at how their modular homes are created in their factory, giving prospects the chance to chat to a talented and enthusiastic team of home building experts about their own project. Whilst this may not initially seem like a lot of incentive for the target market – people who are thinking about building a home – it’s a very valuable chance to find out more about a building process that they may not have considered. They’re thinking about investing hundreds of thousands of dollars into a project, and want to ensure they’ve done all the research possible… so just offering information was enough in this case. 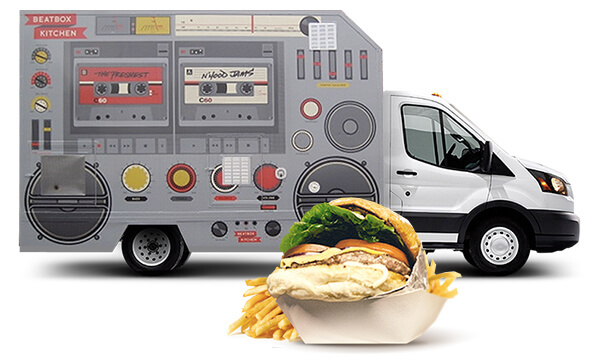 To ensure the event had an atmosphere and that attendees not only got valuable information but also had a good time (especially since most of the target market are families), we decided to invite the services of a local food truck that had a following of its own, BeatBoxKitchen. They provided FREE Burgers (paid for by Modular Builders) to all attendees and entertained with music at the same time. In our experience, we’ve found it’s easy to get people to say they are attending an event online, but to actually get them there sometimes requires an additional incentive. 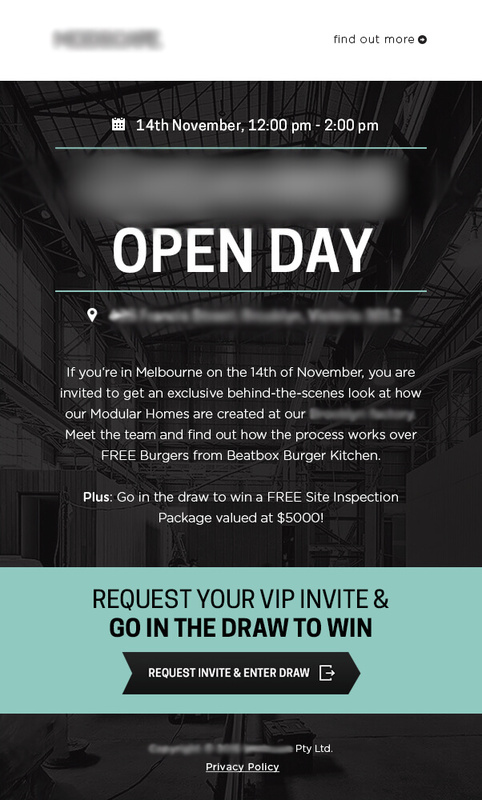 The best form of incentive we have found is a competition, so for Modular Builders we created a competition where attendees could go in the draw to win a FREE Site Inspection Package valued at $5,000. You’ll notice that the prize is very targeted towards Modular Builders’ target market again – that’s intentional and very important. By offering something that only somebody in your target market would want to win, you’re ensuring that the quality of your attendees and competition entrants remains high – something that giving away an iPad will never achieve. With an outline of the event confirmed and a bit of bribery locked in to ensure people attended, the last step was selecting a date. This is very important and can be the difference between a successful event or an empty one. Scan your local ‘Whats On’ guides, check with your target market (who quickly turned down my idea of running it on an AFL Saturday), and research the likely weather that month to see if you’ll need a weather-proof backup plan. 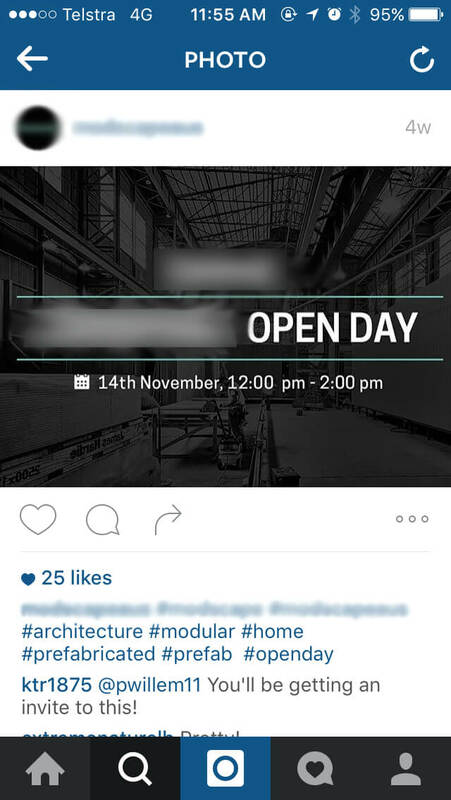 With the event and date sorted, we were ready to move onto the next step – marketing. Having locked in the date, we had to work backwards to figure out exactly when we should launch our digital marketing of the event. We settled on launching the campaigns four weeks before the date (meaning we started getting ready eight weeks before). If you’re hosting a very large event (5,000+ people), you’d want to kick things off a lot earlier than that. We created a highly targeted landing page for the event to send all of our online traffic to. The page used professionally-written sales copy that sold the event’s offer and the benefits of attending (including the burgers!). Rather than just promote the event on the page, we also asked people to request an invite (the incentive of the competition helps here) so that we could easily get their contact details. That way we could send them reminders about the event and market to them in the future (with all signups added to the overall email database). Whilst people could just turn up on the day and attend the event, we found that by adding this call-to-action form, a good proportion of visitors to the page (21.59%) actually did fill in their details and request an invite. As soon as someone requested their invite, it was automatically emailed to them, with full details to help them remember when it was on and to enable them to share it with friends and family. To take this email to the next level, you could also include a referral incentive, like offering extra competition entries for every additional RSVP the attendee gets from people they invite to come along. On the landing page, we added remarketing tags from both Google and Facebook (to enable us to advertise reminders just prior to the event) and we also added social sharing to the ‘thank you page’ to increase the viral aspect of the advertising. As soon as we had our landing page ready to go (just under four weeks before the event), we launched a social media campaign across both Facebook and Instagram to start generating traffic to the landing page and capturing details of people who wanted to attend. Current Fans – Modular Builders has a large number of fans of their brand already, and these made a great first target, as the people following the page have heard of the brand and the great content they produce, but many had not actually considered it for their next project. Remarketing Audience – We had already built a large remarketing audience of people who had visited their website or our “Free Tailored Advice” lead-generating landing page. This was an ideal and large target market to advertise to. Email Database – By uploading their significant email database as a custom audience, we were also able to target this audience with advertising throughout the campaign. With many of these audience members having also received our email marketing (see below), this enabled us to appear on multiple mediums at once, increasing effectiveness. Lookalike Audiences – We also created lookalike audiences of all the different audiences we had built, which were 99% similar to the current fans, remarketing audiences, past leads and email database. These expanded the reach of our marketing to people that most likely had not heard of the brand but who fit the right demographic and interests to be a potential customer. Throughout the campaign, we measured the performance of the individual audiences and adverts and optimised according to the number of people requesting an invite and the cost of each one, which ensured every dollar was spent in the best possible way – important on a limited budget. Having worked with Modular Builders for some time, we knew that the search volume for relevant keywords in their area was high and was proving to be a very cost-effective way to generate leads. We utilised Remarketing and launched text and banner adverts pushing the event, showing them to everyone we’d already built into our audiences of people who’d visited the website or landing pages. We didn’t want to stop people from converting into leads from our standard campaigns, so we had to tread lightly on the Search campaigns we were running. We decided to use sitelinks on all of our Search Ads which promoted the event to those that may be interested, but not as a main focus. If we were running this now, we’d also use Remarketing Lists for Search Ads (RLSA) to show just Open Day ads to people who had already visited the website in the past, but at the time we ran the ads, this feature was not available. If you have a large email database that you’re regularly sending emails of value to, sending the occasional promotional email will likely generate great results. 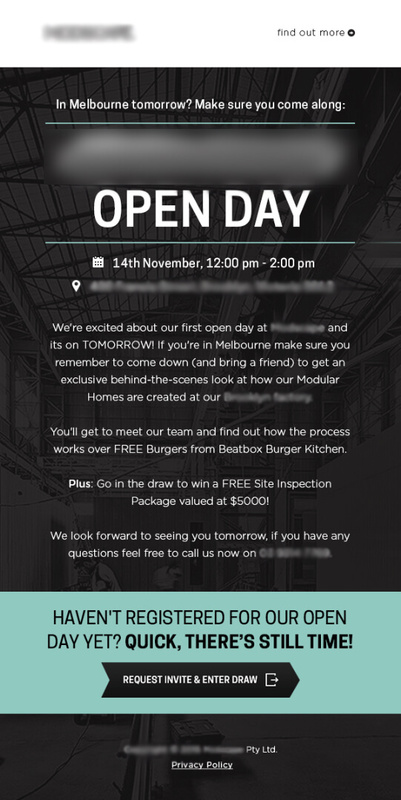 Modular Builders had been sending out great content (with some content even going viral), so we knew sending promotional emails for the Open Day would work well. 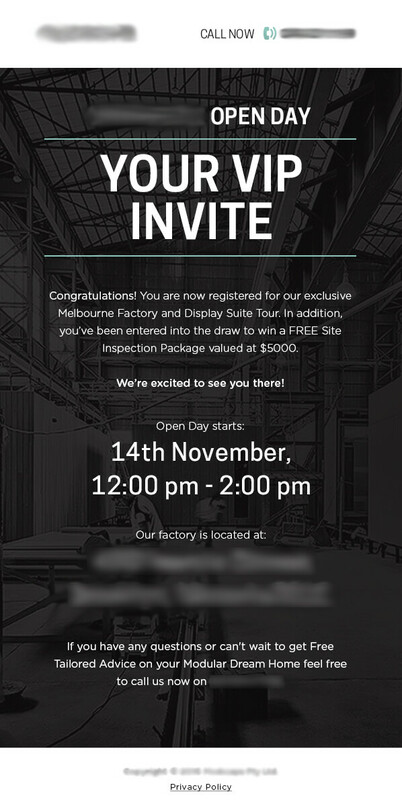 We used the subject line “Are you in Melbourne on Saturday 14th of November?” to ensure that their unsegmented email database, which was geographically diverse, did not get annoyed, and that people knew it was a local event as opposed to a webinar or online event. All of the traffic was tracked (using Google URL Builder) and sent to the landing page we created earlier. 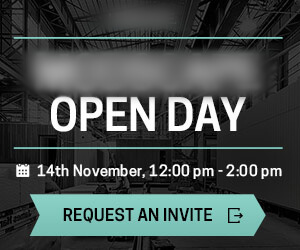 We also sent a reminder email the day before the event to everyone who had opened the email (and shown interest) and to everyone who had requested and received an invite. This email ensured that someone who registered up to 4 weeks ago didn’t forget and miss the event. Most people wouldn’t associate a long-term traffic building activity such as SEO with a short-term promotional event, however if you’ve been carrying out SEO and content creation for some time, as we had, then you can not only utilise the organic traffic you already have, you can also use the event to build additional relevant links. 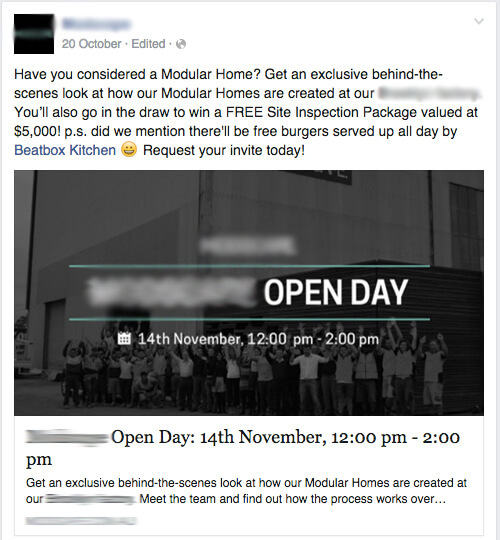 Modular Builders’ blog gets a lot of traffic – some of it from overseas but a lot of it from their main target market, Melbourne – and we aim to turn this traffic into email subscribers. Whilst advertising the event, we wanted to capture all of this organic traffic and maximise the number of people we got to request an invite. To do this, we used the Sumo plugin and installed a floating header bar on every page of the blog. This firstly qualified the user as being in Melbourne at the right time, and then sent people through to the landing page to convert. To further promote the event and to generate some links to help with their SEO efforts in the future, we also did a significant amount of research into local event listing websites and outreached to these sites or created listings to promote the event. We also utilised any third party relationships Modular Builders had to help promote the event, such as prefabaus.org.au, who featured it in their email newsletter and on their website. Along with all of the above marketing techniques, we asked Modular Builders to employ some good old fashioned networking and sales skills and get in touch with old leads, past customers and anyone who they thought would benefit from coming, which they did. Through all of the above efforts, as well as optimising and improving throughout based on data, we were able to generate over 1,000 opted-in attendees that committed to going to the Open Day. This was all done with a marketing budget in the low four figures, and with the cost per opt-in in the low single digits from both AdWords and Facebook – akin to the cost per signups usually seen in an email acquisition campaign, but with the added benefit that they were all in the target market and were interested in attending the event. 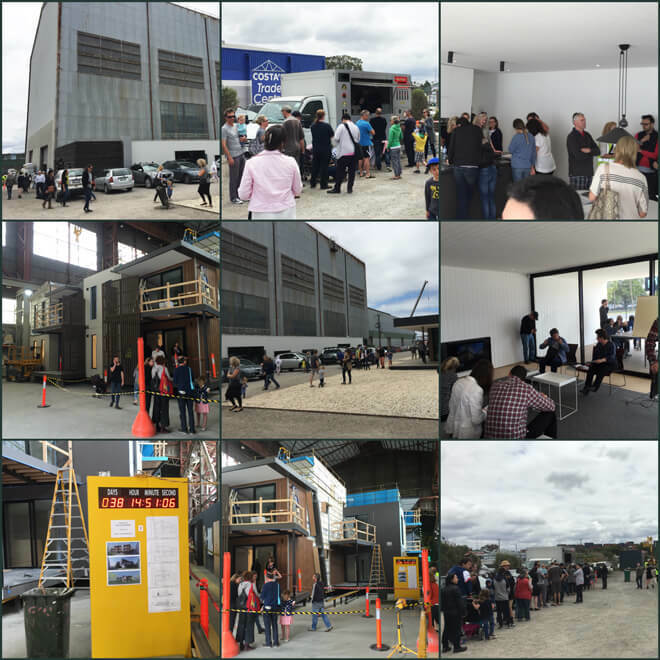 The day itself was a big success with over 700 people attending over the two hours (thanks to the staff members with counters) and taking a tour around Modular Builders’ factory – with queues to get in… and for the burgers, of course. More importantly, the quality of the attendees was extremely high and throughout, Modular Builders’ team chatted to and took down details from a range of interested people, with around 30 of them being high-quality leads who had empty plots of land and were interested in discussing a modular home solution. That’s a potential pipeline in the millions. Over the course of the next few weeks, we continued to market to everyone who attended or opted-in, with each person receiving a call from Modular Builders to scope any projects they are interested in. This was a fun digital marketing campaign for everyone in the Web Profits fluid marketing team to work on and one that we will be repeating again for other relevant fluid clients.